Picture books come in all shapes, sizes, shades and tenors. The feelings they give you, the places they take you, the characters they introduce you to - all are as unique as the individuals who write them. So if you come across the work of an author who is also a Mischief Elf, you might put two-and-two together and surmise that you're in for a bit of silly fun. Or perhaps dozens of freshly baked silly moments, iced with cleverness and sprinkled with snickers. That's precisely what you'll find in the books of Ame Dyckman, pictured below. I'm not sure who is photobombing who in this pic! Ame and her unicorns are cut from the same magical clothe. 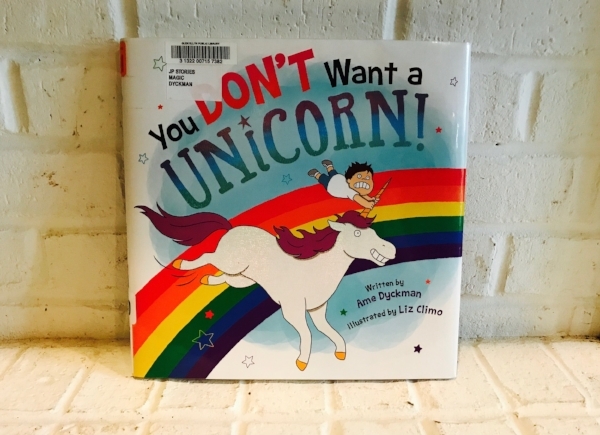 But back to mischief and the Mischief Elf herself: If you are looking for a book that is PURE FUN, then Ame's latest title You Don't Want a Unicorn! is the book for you and your crew. ... is that unicorns aren't exactly as advertised. They are as destructive as they are mysterious. As crude as they are beautiful. And they leave behind a steaming pile of... sweetness?... wherever they go. Trust me. As a picture book author, I continually turn to the work of writers like Ame. She has such command of voice and a crystal clear creative perspective. She also naturally speaks "kid" (it's like she's BEEN one or something!) and connects easily with little audiences and their not-so-grown-up parents. So now I giddily introduce Ame Dyckman (@amedyckman), who has let us behind the rainbow curtain of her imaginative thinking by answering these three Author Spotlight questions. Enjoy! YOU DON'T WANT A UNICORN! is such a FUN read-aloud experience. How do you know when you’ve totally nailed it? Thanks so much for the YOU DON’T WANT A UNICORN! read-aloud love, Anitra! Getting the read-aloud-ness (we’re gonna pretend that’s a word) of a book just right is SUPER important! Parents and guardians and teachers and librarians and booksellers read-aloud to kids who often read-aloud to themselves before they learn to read-in-their-heads. That’s a lot of folks counting on you to make every bit of a read-aloud as perfect as you can! So when I’m writing a new manuscript, I read it aloud approximately 814 times to make sure it has the right ear feel. (Bonus: on nice days with the windows open, it’s funny to see people walking by react to lines like, “STOP! 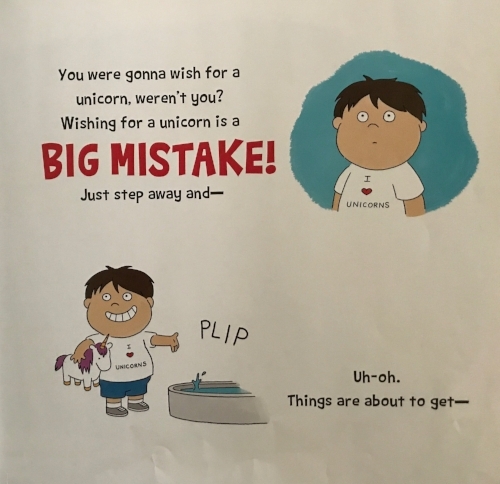 You were gonna wish for a unicorn, weren’t you?”) You finally know it’s a wrap when your read-aloud sounds like you’re just having a conversation with a friend. Which is kinda what books ARE! So… the cupcakes. Too funny! Where did that hilarious idea come from? How have fans (young and old) responded to it? *LAUGHING* HAD TO! A can’t-overlook-it part of caring for a pet (or kid!) is cleaning up their inevitable... er, piles. (And once, after gobbling brightly-colored cupcakes at a party, my then-tot kid TECHNICOLOR PILED!) It’s been a riot watching listeners react to the cupcake scene—especially at events where I’ve brought cupcakes for refreshments! Kids who were drooling over the platter before hearing YOU DON’T WANT A UNICORN! suddenly aren’t so sure they want to eat a cupcake after! And more than one grown-up’s earned Bravery Points from their littles by taking a big bite of their cupcake anyway! Unicorns are so mystical and rare. They could have any number of unexpected qualities! How did you learn that they have an appetite for destruction? THANKS for having me, Anitra! And THANKS for reading, everybody! Thank YOU Ame! You Don't Want a Unicorn! can be purchased in bookstores nationwide, as well as online through the bookseller of your choice. You also can enter to WIN an autographed copy from Ame through my Twitter page and blog!